Anyhow, this sandwich really is super tasty. And it’s quick, also! Even if you have to make the pesto, it’s all “No biggie, the chicken’s on the grill anyhow.” So do me a solid and get your sandwich on dinner-style. I wouldn’t even be mad if you made some sweet potato fries to go with it. But honestly, this sandwich is a dinner in itself. Chug a beer while cooking, drink one with dinner, and boom-shaka-laka dinner is done. Place the chicken in a shallow dish or gallon-sized bag. Top with the marinade ingredients. Make sure the chicken is all covered and set aside for 10 minutes. Meanwhile heat your cast iron skillet on medium-high heat. Crisp up the prosciutto in the hot pan. Remove and set aside. Turn your oven on to 250F. Line a baking sheet with foil. Grill chicken on a grill pan or on an outdoor grill if you’ve got one! Cook for 5 minutes, or so, on each side or until cooked through. Remove from grill and cut into strips. 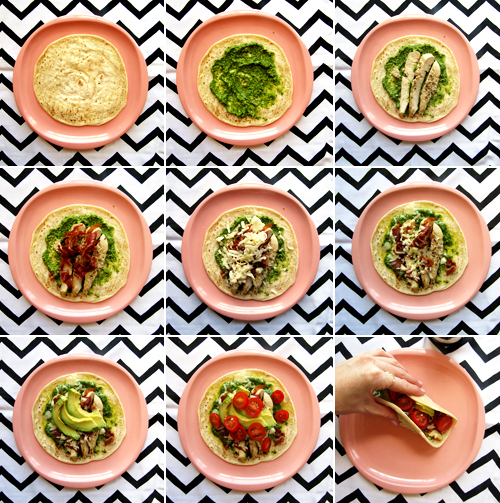 Assemble sandwiches by spreading pesto on each tortilla. Top with strips of chicken, and sprinkle with cheese. Pop onto the prepared baking sheet and bake for about 7-8 minutes or until the cheese is melted. 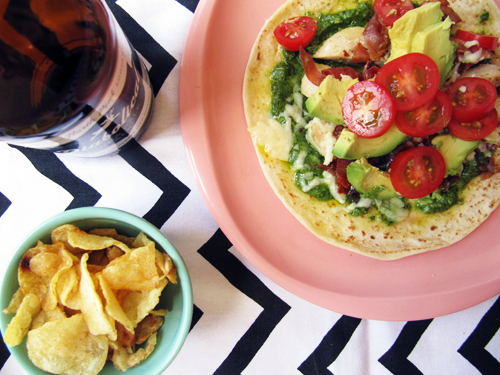 Top with avocado slices and tomato slices. Serve with a beer! P.S. Ideally there would be artichokes on this too! They add a dreaminess for sure. Elliot helps me sample cheese while the chicken cooks. So thoughtful! Love it. I’m always up for a good chicken wrap. I haven’t made any for dinner in so long. This must change. Ueah girl! Get yo wrap on. Bravo on the “wrap” lyrics… This would totally win in any wrap battle and deserves a “mic drop”! Great recipe! I might try this for dinner tonight. I happen to have all of these ingredients at home. I hope you do! Let me know what you think. I love the crispy prosciutto!!! This whole thing sounds awesome! 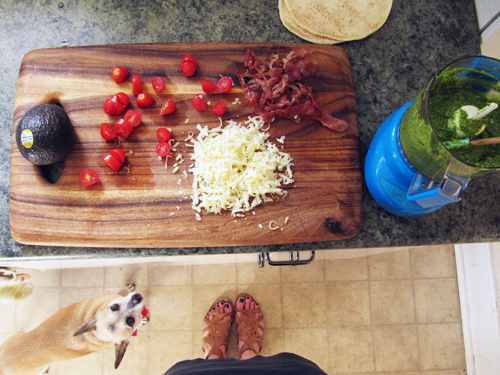 Plus, I am always down to rub pesto all over anything. So good! YES. It pretty much adds awesomeness to everything, right? rhymz for dayyyyys! I bet this is way better than Mudgie’s (even though theirs is pretty damn good! ), and a waitress won’t throw a bag of chips at you! WIN! Yeah! It’s tasty without the sass. So impressed with your rap skillz, yo! I want this chicken wrap for dinner soon! I JUST went to Mudgie’s on Monday and whoa, our food was SO good. Marc had a meatloaf sandwich with bacon (the lady next to us kept staring and then asked what it was called and it was called BAT OUTTA HELL) and I had the special sandwich of the day, sundried tomato pistachio goodness on roasted chicken and fresh mozz. It was blow your mind good. Someone threw a bag of chips and you and Cindy, what the? They have a LOBSTER ROLL??? I did not see that. Only sometimes! I always miss it! 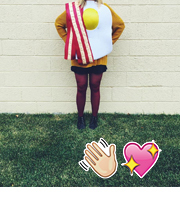 Songs about sandwiches = BEST IDEA EVER. I would listen to a whole album about them alldayeveryday, on the real. 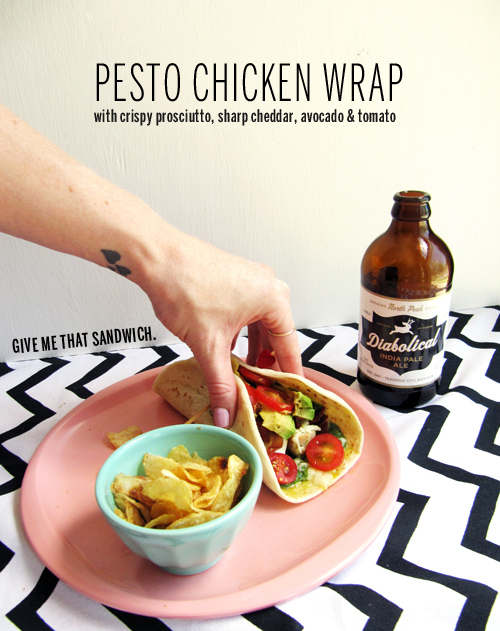 Pesto and chicken in a wrap! Win! This sounds delicious! I love everything with pesto! Pesto is the answer! Thanks, Sarah. I may be missing it, but how much chicken do you need and which pieces? This looks uspre yummy, and I can’t wait to give it a go. Whoops! Good catch! It’s in there now. About 2 chicken breasts will serve 4. Thanks, Tanya! Two things: a) Your rapping had me giggling. Adorbs. b) I think we chicken pesto dishes on the same night. Monday? Kismet. 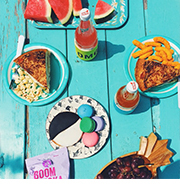 This looks goooooood and will be in our bellies very, very soon. YES! I love that we chicken pesto-ed it up on the same night. Sister dinners, yo! I can have a wrap any day and never get tired of it! I’ve got a teeny weeny bit of pesto lounging around in the fridge. It has something to do now! I hope you love it, Jayne! Secondly, this wrap looks hella good. Pesto chicken forever! This is my ultimate lunch! Add a side of sweet potato fries and I would be in heaven. I would bathe in pesto if society allowed a garlicky, oily, green lady walking around. This recipe looks AMAZING!!!! Also, this is beautiful. Nom.